Here you can define what warnings and prompts will be displayed during test run. Insufficient test run time: Before starting a test, WAPT Pro calculates the time of running one user session for each profile. If the time of running a session for some profile exceeds the whole test duration (specified in the Test Volume view), you will see this prompt. Client certificate: This warning appears when you record pages of a web site which requires the client certificate. By clicking the "Settings" button in the warning dialog, you will switch to the program settings where you can specify the necessary certificate file. Convert to streaming: This warning appears when you click the command Convert To Streaming on the right-click menu of some request in the left pane. If you confirm this action, the selected request will be converted to streaming. Convert to request: This warning appears when you click the command Convert To Request on the right-click menu of streaming object in the left pane. If you confirm this action, streaming will be converted to request. Advisor messages..: Opens WAPT Advisor Messages dialog where you can specify which prompt messages will be shown in case some trouble event occurs. Adobe® Flash® detection on recording: This prompt is shown when WAPT Pro detects the AMF messages in recorded requests or received server responses (in case a special Module for Adobe® Flash® Testing is not installed on your computer). 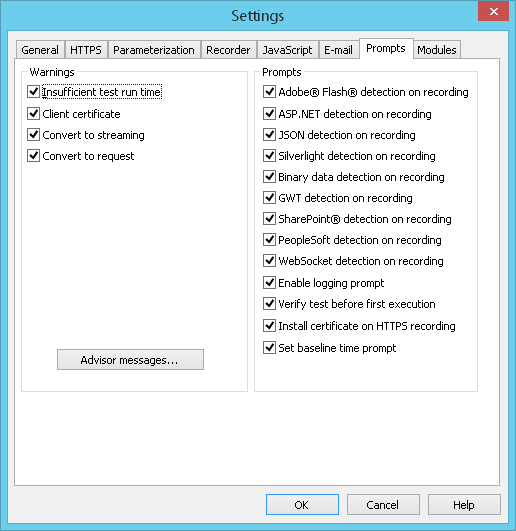 ASP.NET detection on recording: This prompt is shown when WAPT Pro detects the ASP.NET controls in recorded requests or received server responses (in case a special Module for ASP.NET Testing is not installed on your computer). JSON detection on recording: This prompt is shown when WAPT Pro detects the JSON formatting in recorded requests or received server responses (in case a special Module for JSON format is not installed on your computer). Silverlight detection on recording: This prompt is shown when WAPT Pro detects the Silverlight data in recorded requests or received server responses (in case a special Module for Silverlight testing is not installed on your computer). Binary data detection on recording: This prompt is shown when WAPT Pro detects requests with the binary data during recording (in case a special Module for Binary Formats is not installed on your computer). GWT detection on recording: This prompt is shown when WAPT Pro detects the GWT data in recorded requests or received server responses (in case a special Module for GWT testing is not installed on your computer). SharePoint® detection on recording: This prompt is shown when WAPT Pro detects the SharePoint "request digest" tokens in recorded requests or received server responses (in case a special Module for SharePoint Testing is not installed on your computer). PeopleSoft detection on recording: This prompt is shown when WAPT Pro finds the PeopleSoft specific cookies in request headers during recording (in case a special Module for PeopleSoft Testing is not installed on your computer). WebSocket detection on recording: This prompt is shown when WAPT Pro finds WebSocket connections during recording (in case a special Module for WebSocket Testing is not installed on your computer). Enable logging prompt: This prompt suggests you to turn logging on in case logs are disabled in Log Settings. By default, logs are disabled for efficiency reasons. You can select a desired type of log file in the Log level of detail combo-box just in the prompt dialog. Verify test before first execution: This prompt suggests you to verify the test scenario before running the test if the scenario was not yet verified. Verification is useful to make sure that your scenario does not contain errors, especially in case you use dynamic parameter values. Install certificate on HTTPS recording: This prompt is shown when the Recorder proxy intercepts the secure traffic during recording (in case the Recorder root certificate is not installed on your system). The prompt suggests you to install the Recorder root certificate. Set baseline time prompt: This prompt is shown after the test verification. It allows you to set the response time of each request measured during the verification test as baseline response time for load tests. Baseline response time for each request can be modified on the Response processing tab.